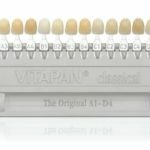 Whitening, Is it for You? A common request from patients at Charlottesville Dental Health Partners is “I would like to lighten (whiten) my teeth”. With all of the vices in our daily life (Coffee, Wine, Tea, Soda) plus the natural darkening of our teeth as we age (EEKK), our teeth can darken seemingly overnight. Lightening your teeth is one of the simplest and most dramatic things that one can do for their teeth. Before we embark on the options out there, it may be smart to stop and actually try to shed some light on what lightening is. Tooth lightening is often referred to as “Bleaching”. That is a bit of a misnomer. The active ingredient is not Bleach, but Hydrogen Peroxide. Instead of “Bleaching” we should refer to it as “Perioxding”. Jokes aside, the basic ingredient is Carbamide Peroxide. When introduced in the mouth, this agent changes to Urea and Hydrogen Peroxide. The Hydrogen Peroxide attacks those evil Free Radicals, eliminating them and lightening your teeth in the process. The Urea that is produced actually helps by raising your mouth’s pH and helping to slow or eliminate cavities. That is right, lightening can keep you from getting cavities. So, now that we have an idea of how lightening works, it is important to discuss the options out there for lightening. Rinses and toothpastes have not been shown to whiten your teeth. Do they remove stain? Maybe. However, they do not cause a difference in the color of the teeth. To lighten your teeth, you need to have a gel sit on your teeth for a period of time. There are strips you can buy in the store that will lighten your teeth. Varying products will have different concentrations of the key ingredient, Carbamide Peroxide. This difference in concentration will result in differences in wearing time (from 30 minutes to overnight). It is important to carefully apply the strip and wear per the directions. The other choice is to have trays made here at CDHP for your teeth. The advantage is these trays are custom fit for your teeth. We can then have you use lightening gel that you wear for 30 minutes a day. Most patients are happy after about 3 weeks of wear. The lightening process does not damage the teeth. Some patients may experience gum irritation (sensitivity). If this happens, we recommend using the lightening trays every other day. For most patients, lightening is stable for around 2 years. Tobacco use and dark beverage use will shorten the time that lightening is stable. Most patients will want to whiten until their teeth match the “white in the eyes”. This provides for the most natural outcome. It is important to know that tooth color fillings and crowns will not whiten. If these are in front of the mouth, please talk to us about options before starting lightening. It is possible to whiten teeth that have darkened due to tetracycline staining, although that will take longer. It is also possible to whiten individual teeth and teeth that have had root canals. Finally, some teeth have white or brown spots. Lightening and microabrasion can reduce or eliminate the spots. Please do not hesitate to contact us if you have any questions about or are interested in lightening your teeth.